Wednesday Wrap: take Netflix on holiday, learning headphones, B&O makeover | What Hi-Fi? From the news that you could soon be streaming House of Cards while on your holiday in Spain, to B&O giving one of its iconic speakers a new colour finish, and headphones that measure sounds going in and out of your ear - it's What Hi-Fi? 's Wednesday Wrap. 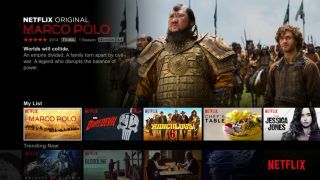 You could soon find yourself watching Netflix’s UK catalogue of content while on holiday in the European Union if a proposal made by the European Commission is approved. The proposal has been made in an effort to break national barriers between the 28 member states of the EU and is hoped to come into force in 2017 - the same year mobile roaming charges are to be scrapped in the EU - if approved on 26th May this year. It would mean people who pay for subscription services such as Netflix and Now TV would be able to watch content when they “temporarily travel abroad” for a “limited amount of time”. Reuters reports that broadcasters aren’t completely sold on the idea, as they’re worried film and TV show producers could demand more money for making their content portable. New headphones that measure your hearing and adjust music accordingly to deliver “the right sound” are available to pre-order on Kickstarter. The Nura headphones combine an over-ear and in-ear driver and are claimed to measure and adapt to your hearing within 30 seconds of putting them on. The two-driver design has been used to deliver “the deepest bass and clearest tones” as well as provide a high level of noise isolation. The headphones connect to the Lightning or USB port on your smartphone and use a built-in microphone to measure your hearing. In much the same way as calibrating a home cinema system, the headphones play a series of tones. They then work out how those sounds enter your ear, and which sounds come back out. The headphones are then said to adjust their settings to “sonically match your ears perfectly”. The Nura headphones have already surpassed the $100,000 funding goal on Kickstarter. You can pre-order a pair from $179, with worldwide shipping expected from April 2017. The BeoLab 18 is now available with two base colour options, aluminium or black, with maple, oak, walnut, white, black and now smoked oak lamella finishes. The BeoLab 18 starts from £3730 per pair with the smoked oak cover available for £870 a pair. Raumfeld has announced it’s to be the latest manufacturer to use the Google Cast streaming platform. The addition of Google Cast to Raumfeld multi-room speakers means more streaming services, such as Deezer, Qobuz and Google Play Music, can be used to send audio around your home. All current Raumfeld speakers will support Google Cast following a firmware update.